Marvel Entertainment Announces Creativity Studio Stylus and App for iPad Combined, the Stylus and App let kids learn to draw their favorite Marvel characters and will be available in time for the Holidays. 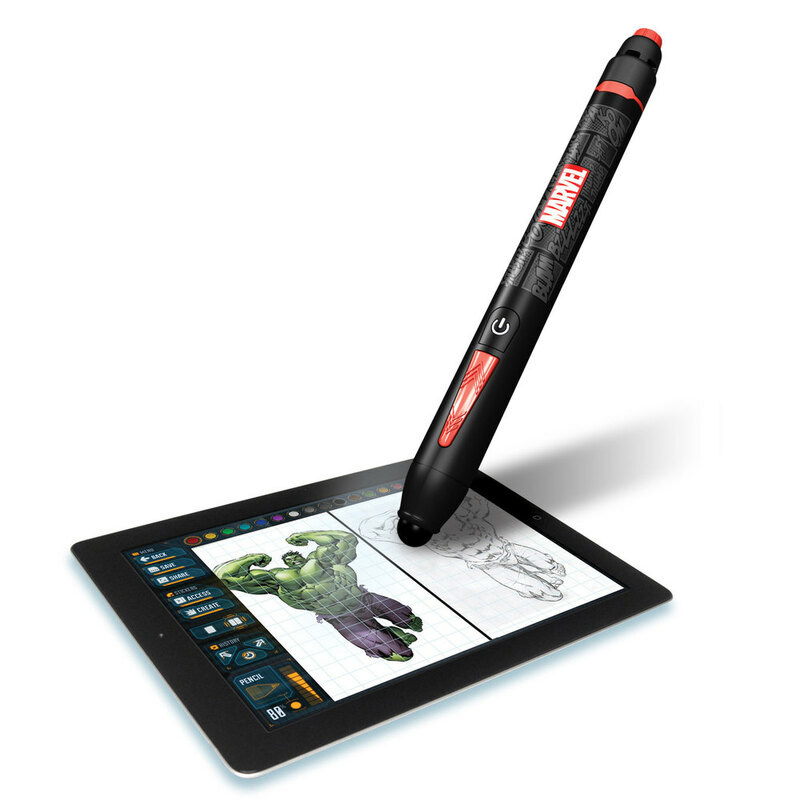 Giant Marvel stylus for iPad? Glendale, Calif. (October 24, 2013) - Disney Consumer Products (DCP) and Marvel Entertainment today announced the launch of the Marvel Creativity Studio Stylus and App, created by eKids, exclusively for iPad. The app delivers a creative space for kids to learn to draw, color and animate their favorite Marvel Super Heroes and villains from Avengers Assemble, The Ultimate Spider-Man and Hulk and the Agents of S.M.A.S.H., while the stylus adds special and enhanced play value. "The Marvel Creativity Studio is an innovative way for fans of all ages to learn how to draw some of Marvel's most popular Super Heroes while allowing them to use their imagination to feel like they're part of the action," said Josh Silverman, executive vice president of global franchise licensing and commercialization at Disney Consumer Products. "Leveraging the comic drawing history of the Marvel brand with the innovation that eKids brings to the table - or in this case, tablet - this product delivers a fun experience with endless play value." * Use of the stylus to unlock special tools including the " Reveal"
The Stylus - which includes unlimited access to all content and future updates - is available at mass retailers. A deluxe version with a limited edition zippered carry case is available exclusively at Apple Retail Stores and from the Apple Online Store; both retail for $34.99. The Marvel Creativity Studio app is FREE and may be found at www.appstore.com/MarvelCreativityStudio<http://www.appstore.com/MarvelCreativityStudio>. For more information, visit www.eKids.com<http://www.ekids.com/>. Disney Consumer Products (DCP) is the business segment of The Walt Disney Company (NYSE:DIS) that delivers innovative and engaging product experiences across thousands of categories from toys and apparel to books and fine art. As the world's largest licensor, DCP inspires the imaginations of people around the world by bringing the magic of Disney into consumers' homes with products they can enjoy year-round. DCP is comprised of three business units: Licensing, Publishing and Disney Store. Marvel Entertainment, LLC, a wholly-owned subsidiary of The Walt Disney Company, is one of the world's most prominent character-based entertainment companies, built on a proven library of over 8,000 characters featured in a variety of media over seventy years. Marvel utilizes its character franchises in entertainment, licensing and publishing. For more information, visit marvel.com<http://www.marvel.com/>. eKids, a distributor of cutting edge electronics in collaboration with iHome, now brings your favorite licensed characters to life on iHome's award-winning and innovative products. We combined state-of-the-art technology with preeminent licensed characters from some of the world's biggest brands. The result is a line of interactive apps and styluses, fashion forward speaker systems, alarm clocks, headphones, ear buds, and iPod and mp3 docks that appeal to trendsetters of all ages looking for quality electronics and fun activities featuring iconic characters they love.